Neil Shusterman is one of my favorite authors. His books aren’t mainstream; in fact, some of them are almost a little off. That’s why I like them so much. Unwind is one of those books that’s just a little off. It’s a future version of the world where implanting organs and the harvesting of them is taken to the horrific extreme, what they call “unwinding”. Your entire body is taken apart and implanted into other people. You’re a hundred percent alive, so you don’t die at all, it’s just… a “retroactive abortion”. That can happen to you at any time up to the age of 18. The world in Unwind is well thought out, with a futuristic society similar to our own and yet different. 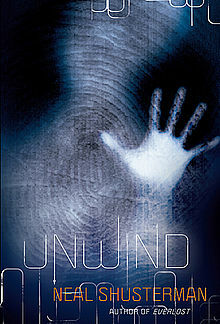 Not the book for those who want happiness and love and such, but if you’re looking for a slightly darker book, Unwind is for you. Editor’s note: I read this book a while ago and it was amazing. It is creepy and weird and, as Josh said, a little off, but highly recommended. Pick it up for a good winter break/snow day read that will leave you captivated.